Home » Blog » Roof vacuuming » Allergies » Open Season! Did You Know: Rats and Mice around your children are a dangerous combination? Yes, mice and rats can be a hazard to your children. Rats and mice can carry disease. The most common is salmonella (an infection from the bacteria) which causes diarrhea, fever, and abdominal cramps. Humans can get infected with diseases after handling a rat or mouse, their feces, urine, or saliva from a bite), or by eating or inhaling contaminated food, water, or dust. Disease can also be spread from ticks, mites, or fleas that have fed on an infected rodent. Rats and mice carry many diseases such as Hantavirus Pulmonary Syndrome, Rat-bite fever, Leptospirosis, and Lymphocytic Chorio-meningitis. Rodents can contaminate food with their urine, feces, and fur. Rats and mice can damage property by Chewing through rubber, aluminum and other soft metals, cinder blocks, plastic, and wood. Urban environments provide excellent living areas or habitats for rats and mice During Winter. They eat almost anything and Breed very quickly. When there is a rodent infestation, humans are at higher risk of getting sick. 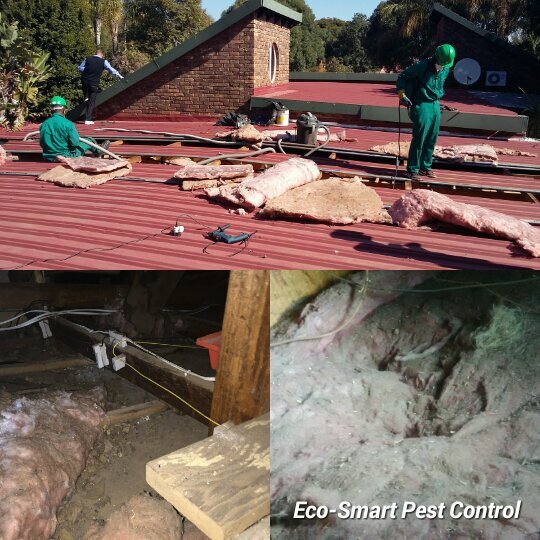 Eco-Smart Pest Control cares about your family and their health hence we offer ceiling and roof vacuuming. ← Who’s in the House?